"Still, the rules did not say teams had to pass, merely that they could. And, overwhelmingly, they chose not to. But there were exceptions, and the new rules inevitably gave rise to history's first forward pass. On September 5, 1906, in a game between St. Louis University and Carroll College, a quarterback named Bradbury Robinson threw the first downfield overhand spiral pass. The first team to really grasp the significance of the rules changes was the Carlisle Indian Industrial School, in Carlisle, Pennsylvania, which had been founded in 1879 as the first federally funded, off­-reservation boarding school for Native Americans. The school's football team was coached by a man named Glenn Scobey 'Pop' Warner, considered to be the father of the modern game of football. 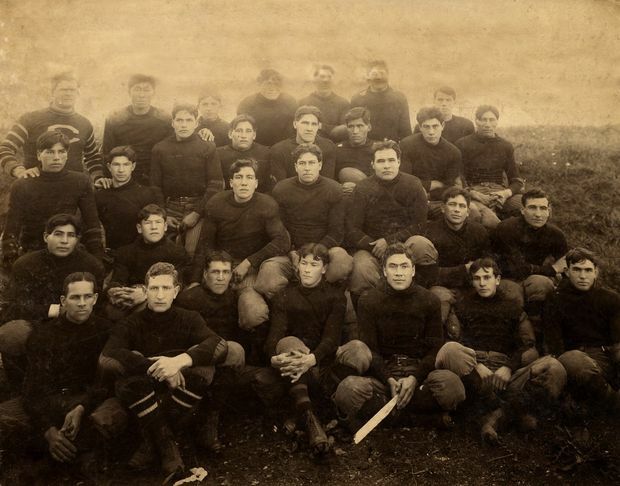 Using speed, deception, forward passes -- the Indians had somehow figured out how to throw short spirals with the unaerodynamic ball -- and Warner's brilliant new single wing formation, the Carlisle School became one of the most exciting teams in the country. In a landmark 1907 game against the fourth-ranked, unscored-upon University of Pennsylvania, the Indians completed an unheard-of 8 of 16 passes, gained 402 yards to Penn's 76, and won 26-6. This was in spite of Penn's huge size advantage. A Sac and Fox Indian named Jim Thorpe made his debut in that game, threw a complete pass, and cut loose on a 45-yard run. Two months later Carlisle beat perennial powerhouse Harvard, spawning a near riot on the field. "Despite such successes, the main body of the game clung tightly to tradition. Harvard and Penn took no particular lessons from the pass-happy Indians, other than the idea that they were running a screwy novelty act. Hardly anybody else did either. Predictably (since it continued to center on smash-mouth, mass formation running plays), the game's mortality rate started to rise again. Between September 1908 and the summer of 1909, the Chicago Tribune reported 31 deaths related to football. Two in particular shocked the nation. On Oc­tober 16 Navy's star quarterback suffered a fractured spine, which led to paralysis and death. Two weeks later, as Harvard bulldozed downfield in one of its trademark massed formations, an Army tack­ler dived headlong into the oncoming mass, breaking his neck and upper spine. He died two days later. Army and Navy both canceled the rest of their seasons. Those deaths, at such prominent schools, sparked renewed controversy, and rules were changed again, to require only seven men on the line of scrimmage and to allow only one offensive player in motion in the backfield. "Passing's real breakthrough into the national consciousness came in 1913, after even more rules were changed and the ball was made less blunt and more airworthy. On November 1, Army, thought to be the best team in the country, took on upstart Notre Dame, a small regional college in Indiana that no one in the East took the least bit seriously. In fact if anyone at Army or in the eastern press had cared to look, they would have seen that the Fighting Irish's statistics that season were downright scary. They had scored 174 points on their last four opponents -- an unimaginable number to the East Coast football powers -- and they had done it by throwing passes in ad­dition to the usual runs. The East Coast press and football powers tut-tutted and rolled their eyes and rationalized it all by saying that this little-known Catholic school had beaten a bunch of nobodies. The New York newspapers added to the general dismissal of Notre Dame, reporting that West Point would be playing a team from South Bend, Illinois. The boys from Army, of course, were sticking to their old rough-and-tumble ground game. "They would soon have cause to rethink their assumptions. 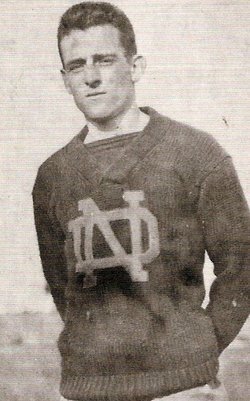 In the middle of the first quarter, with the game tied, 0-0, Notre Dame quarterback Charles Emile 'Gus' Dorais took the snap from center, dropped back five steps, and launched a perfect spiral that traveled 40 yards and hit receiver Knute Rockne at a full run for a touchdown. It is impossible to fully appreciate today the shock that this single play produced. Neither the Army team nor the spectators had ever seen anyone throw a football 40 yards, much less a perfect strike to a sprinting receiver. 'Everybody seemed astonished,' recalled Rockne, who would go on to become the 20th century's most famous college football coach. 'There had been no tackling, no plunging, no crushing of fiber and sinew. Just a long-distance touchdown by rapid transit.' It was as though, in that split second, when the ball had landed in Rockne's outstretched hands, the men on the field were suddenly playing a completely different game, one that involved speed and deception and movement through open space instead of the usual bloody grind. Dorais mixed long and short passes with the usual runs, and Notre Dame not only upset the favored team but completely outmaneuvered the Black Knights, 35-13. (On the Army bench that day sat an injured, deeply frustrated halfback named Dwight David Eisenhower. Next to him sat his injured roommate, Omar Bradley.)"